The hair milk is amazing! I absolutely love it! I have 4c hair so I assumed it wouldn’t work for my thick curls but it does! My hair has been so soft since I started using it and I dont even have to pack it on. Loves it! Yesssss tgin! This product is everything! It literally smells like honey and is so rich and creamy. I tried it before an event I had and I got so many compliments on the way my hair not only looked but smelled. I’ve also noticed a huge decrease in breakage since I started using it. Another amazing product by tgin! Another amazing product by tgin! I’ve been using this after I wash my kids hair and it is a godsend it literally glides and I mean glides through their 3b to 4c hair textures like butter. I get so many compliments on how well their hair looks as well. This has made it so much easier for me to get them out the house in the morning and to get through wash days I can not sing tgins praises enough. Amazing on type 4 hair! Best daily moisturizer for natural hair styles. All I can say is wow! 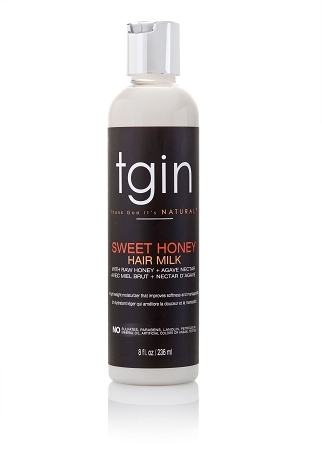 The sweet honey hair milk has made its way up to my favorite products list. The hair milk is so lightweight, provided great shine and definition. The slip that this product has as you're applying it is great. I paired the hair milk with the TGIN leave in conditioner to give me some extra moisture. I was highly impressed!